Martin Luther King Jr. Day is an official US holiday observed with parades, community events, and festivals to honor Martin Luther King, Jr. on "MLK Day", celebrated this year on Monday, January 21, 2019. Across the nation public schools, libraries and post offices are closed on MLK Day as well as banks, the Wall Street stock market, and many businesses that observe the holiday. Traditionally, the day is marked by live readings of his famous speeches, as well as poetry and songs inspired by the man and the movement he led. Also watch for MLK Day neighborhood activities taking place in the nation's capital, across the nation, and around the world — in a day of service commemorating the life and work of the history-making civil rights leader. Even in to the 21st century, the life of the Nobel Peace Prize winner and civil rights leader continues to inspire people around the world with his message of non-violence and equal rights for all. Although he always promoted peacful protest, King was a central firebrand of the 20th century civil rights movement, beginning with the 1955 Montgomery bus boycott in Alabama. "I still have a dream, a dream deeply rooted in the American dream – one day this nation will rise up and live up to its creed, "We hold these truths to be self evident: that all men are created equal." 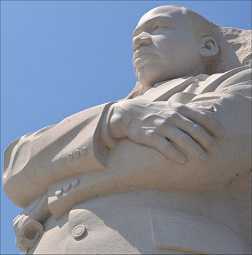 I have a dream..."
On education: "The function of education is to teach one to think intensively and to think critically. Intelligence plus character - that is the goal of true education." On tolerance: "Darkness cannot drive out darkness; only light can do that. Hate cannot drive out hate; only love can do that." On service to others: "Everybody can be great...because anybody can serve. You don't have to have a college degree to serve. You don't have to make your subject and verb agree to serve. You only need a heart full of grace." On perseverance: “If you can't fly, then run, if you can't run, then walk, if you can't walk, then crawl. But whatever you do, you have to keep moving forward." The King Center - With inspiring calls to action for continuing his work, a history of MLK Day, information on current events and celebrations, plus theme graphics and clip art. Nobel Prize.org - Martin Luther King - Biography - His life in a brief bio, the complete Nobel acceptance speech, and related resources. Martin Luther King Jr. Quotes - The most famous quotes including those from his Nobel Prize acceptance speech, "I have a dream." Capture the Dream - Courtesy of the National Parks Service featuring info and hours of official MLK historic sites including the visitor center, his birth home, the Ebenezer Baptist Church and more together with special programs and recent news. Lesson Tutor : Thematic Studies : Martin Luther King, Jr. - A rich K-12 resource for teaching school children about the holiday featuring lesson plans, activities, recommended reading, worksheets and downloadable coloring pages.